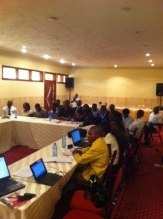 13 September a stakeholder meeting was organized in Kinshasa to discuss this proposal. Participants included representatives of diverse NGOs and the government. Valuable comments and suggestions were taken in order to adjust and refine the proposal and the approach taken. First step is to execute a pilot project on micro-zoning by participative social cartography which is foreseen to commence end of 2012/ beginning of 2013. Once completed, this will contribute to respecting user rights of local communities at the chosen site. Lessons learned from this first exercise can be incorporated in consecutive micro-zoning activities with other forest companies. Soon, a specific location will be chosen for the pilot after which a tender will be open for an expert team to execute this pilot project.